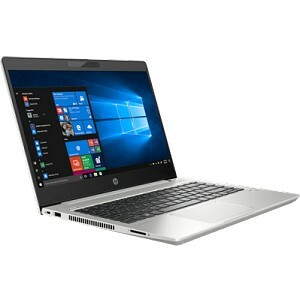 The 13.3" ProBook 430 G6 Notebook from HP is a business-oriented system for professionals to stay productive in the office and on-the-go. A few helpful features include a slim chassis, a 180° hinge, and up to 14 hours of battery life. Specs-wise, it's powered by a 1.6 GHz Intel Core i5-8265U quad-core processor, 8GB of DDR4 RAM, a 256GB PCIe NVMe SSD, and integrated Intel UHD graphics. Its 13.3" IPS display has a 1920 x 1080 resolution for clear details an anti-glare coating to reduce distracting reflections. Other integrated features include an SD card reader, a Gigabit Ethernet jack, 802.11ac Wi-Fi, Bluetooth 4.2, USB Type-A and Type-C ports, an HDMI port, a webcam, a microphone, speakers, and a 3.5mm combo audio jack. The operating system installed is Windows 10 Pro (64-Bit).